I have a confession, I have never used a rug pad. We always had rugs that never slipped, slide or they were in a position that it didn't matter much. Well that all changed with this new rug. You barely bump a piece of furniture and the whole thing would shift. With the kids always running about I knew it was an accident waiting to happen. There was a few close calls for myself while simply walking so when Rug Pad USA asked if I had a need for a pad to review I jumped at the chance. I asked for something that would not damage the antique floors and that would keep the rug from continually shifting and sliding. They recommended a premium lock felt pad and I could not be more thrilled with the difference it made. It keeps the rug from moving about and I feel so much better knowing that the kiddos are less likely to bite it while playing. 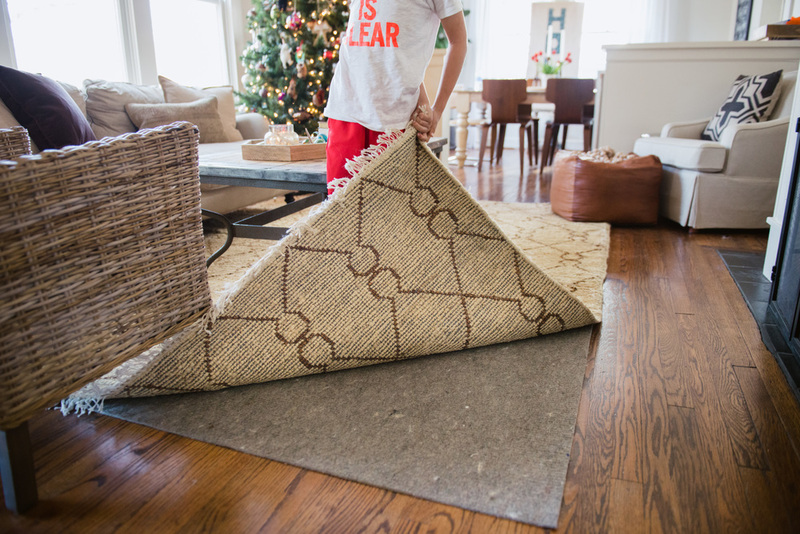 Pretty rugs are so not worth potential disaster. KJ my ever so sweet model shares a peek of the actual pad. It has a bit of loft to it so it makes the rug more soft too. The Mr was especially happy about that one. Our old rug had great thickness and this one was just a bit hard so the little extra the pad gave made the world of difference. This room I can finally say is complete! Well except for the window coverings, but that won't be till next year probably. Oh, and of course wherever KJ is this pup is sure to follow. HA. * opinions are always my own, but the pad was given to me by Rug Pad USA for review.